Some of my recollections, of the Navy service days, have dimmed with time. But certainly some events remain imbedded in my memory bank and will stay forever. This tale is one that I recall every time I see a Navy Corsair. Early in 1952, the Daly was conducting gunnery exercises off Guantanamo Bay, Cuba. On this occasion, we were to conduct an aerial target shoot using the “New” Mk 25 Gun Fire Control Radar. The Daly had just had the obsolete “bed screen” antenna replaced and this was to be a crucial operational test of the new system, it’s operation and accuracy. Part of the days exercise was to fire the 5”38 guns, using the new Fire Control Radar, at a sleeve that was being towed by a Navy Corsair. From my position, in the Main Fire Control Director, a level above the bridge, I was peering through our gun sight optics tracking the target sleeve in the sky high above us. The Pointer, my partner in the Director, and I reported to the Control Command Center (Plot) that we were having problems staying on the target sleeve because the Radar was “hunting” back and forth instead of locking on the target. It seemed that the Radar was trying to run up the sleeve towards the plane. This was causing the computer to receive information that the target speed was faster or slower then it actually was. Each time it did this, it gave the computer a false indication of the true target speed. This in turn affected the calculated trajectory, which would cause the guns to shoot at a “target it believed to be farther ahead of where it should be. My initial reports to the Command Center (Plot) recommending that we delay the exercise were being over ruled by an eager, excited Gunnery Officer, sitting nearby me in the Director, to fire the guns. Shouts of “Commence Fire” came over the phones. On reflex with the command to “Fire, I closed the firing key, and observed that the Radar was creeping up the cable, toward the plane. My immediate response was to release the “firing key” and I screamed into the phones, “Cease Fire” and pulled the alarm. To my surprise and totally ignoring my command, someone continued to shout “ Commence Fire, Commence Fire”, I felt the rumble as the guns fired. Anxiety spread through my body as I pressed my eye tighter to the gun sight and saw a 5-inch shell burst right beside the tail of the Corsair. The design of the Proximity Fuses used in this exercise was designed to explode the shell within 50 -75 ft of the target. The shell burst pattern, with shrapnel, was close enough to have destroyed the tail section of the plane. The shouts of “Commence Fire” coming from the Gunnery Officer in the Fire Control Director continued even after the shell burst. Seeing the seriousness of this matter I held to a “Cease Fire,” holding the firing key open. There was silence, no guns fired! All action had ceased. 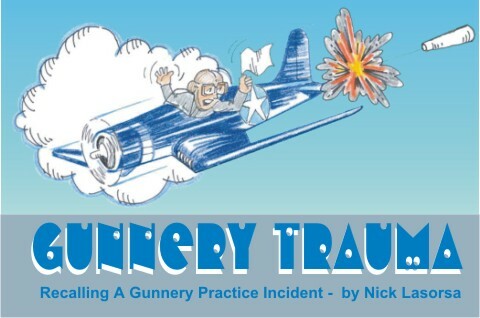 The Gunnery Officer turned to me and bellowed “You, are on Report”! I tore off my headphones and pulled my self out of the overhead hatch and headed below. Someone came up to me and said I was to report below to the Chiefs Quarters, to meet with the Fire Control Chief. On my way below, I took noticed that all the gun barrels were slowly dropping down to the deck. All power has been shut down to the guns. Our Fire Control Chief was the perfect model of a Navy Chief. Extremely efficient and strongly defensive of his men. I was only in the Chief’s Quarters a few moments when a line of officers appeared at the hatch. It seemed that each one had a report chit in his hand. They were stopped cold by the chief with his firm words of reality, “This is just practice, and that was an American Pilot in that plane”. His comments continued that I represented his “Eyes” in the Fire Control Director, and had orders from him to shut down the exercise if anything should appear wrong. He told them that “he” ran the ship when “we” fire the guns. With these final comments it was agreed that the exercise would continue, with caution. At this point all Officers left the Quarters. Mean while, after that shell had exploded perilously close to the plane, the pilot pulled his Corsair hard up into the clouds and disappeared. A short while later he radioed down with these words that I will never forget. P.S. I was not put on report !